Prepare for your electronics to be assimilated. No, it isn't some Borg-like alien invasion you need to worry about. Rather, it's the accelerating convergence of all your audio, video and computer stuff from separate technological niches into an organized whole in which all of your techno toys can talk – and work – with each other. It's a logical development. Everything is becoming computerized and computerization is driving convergence: TV's can now interface with computers, computers can play movies and the Personal Video Recorder (PVR, a.k.a. DVR – Digital Video Recorder) uses computer-type hard disk drives to bring incredible new flexibility to watching and recording TV (think of it as the VCR dragged into the 21st century). And they're all being tied together by computer networks, which means you can now store your audio and video libraries on a central server and play them back anywhere you want. Why would you want to? Well, many people have multiple televisions throughout the house – from a big screen HDTV in the family room to a little LCD on the kitchen wall (for those emergency trips to the fridge while the Big Game is on) and maybe even a screen in the master bedroom. Many people have more than one computer, and more than one audio system. Tying them all together adds flexibility and convenience, allowing access to one's A/V library, and even the Internet, from anywhere in the building. To rip off the old song: "This is the dawning of the age of the media center." Wikipedia describes a media center as "a computer adapted for playing music, watching movies and viewing pictures stored on a local hard disk drive or on a (in some cases wireless) network… and often for watching and recording television broadcasts." That a good starting point. The heart of a media center is the server, which performs the same function as the server in a computer network: it's where all your stuff is stored digitally, and from where it's disseminated to whatever part of the house you want. 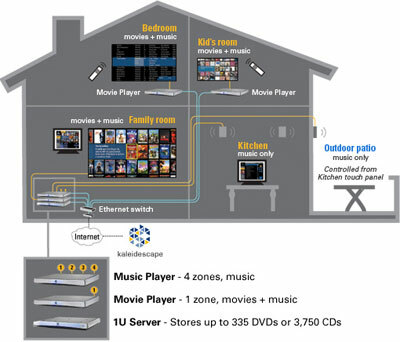 One example of a higher end server is the Kaleidescape System, which can play different programs simultaneously to different parts of the house. 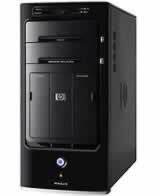 A lower end server could be any Media Center PC robust enough to meet your needs, with a built in TV tuner and a big enough hard disk drive to store your stuff. Getting the music and/or video to the rest of the house is accomplished usually with a wired network (for bandwidth and security reasons), though a wireless network can also work, assuming your chosen components are wireless-capable. If you're going to wire your castle, it's a lot easier if you plan ahead and do the job while the house is being built. That isn't always possible, of course, so retrofitting is often the only practical choice, especially if you're renovating anyway. And retrofitting can be accomplished in ways that won't have you tripping over wires as you go about your daily business. Usually. As with everything, Murphy's Law often raises its ugly head, as when we tried running an HDMI cable through our home theater's ceiling, only to be stymied by beams that ran in every direction and blocked us from feeding through the cable without calling in professional help. Being cheap, we found a workaround that, while ugly, works fine. A good media center can offer the flexibility to send different audio formats to different rooms. For example, you may want stereo speakers over the hot tub, a full 7.1 system in the home theater, a 5.1 system in the family room, and a TV (but no extra speakers) in the kitchen. All this can be accomplished if you have the right server and the right hardware and software. It probably means more wiring, though, because you need cables for the speakers themselves. Wiring for speakers presents the same problems as stringing a network – and can be done at the same time to minimize hassle. If you're retrofitting, there are products available that can help you hide wires that just have to be run outside the walls (including inexpensive little plastic tubes you can paint the same color as your walls). And some audio manufacturers make wireless surround speakers that could help cut some of the clutter. Powering your speakers requires an amplifier channel for each speaker you want to drive, assuming they aren't self-powered (and most aren't). Many companies offer single or multi-channel amplifiers that will make your speakers sing regardless of where they are, and there are models available for nearly every budget. The amps don't have to be near the speakers; you could mount them in your main home theater, or put the server and the amplifiers in a well-ventilated (and AC power-equipped) closet or dedicated server room and run wires from there to the remote locations just like you ran the network cable. Naturally, you'll probably want to run all your wires at once to save hassle. A media center needs a brain, too, a way to control all your stuff from wherever you are. It can be as simple as a bunch of wireless universal remote controls, possibly with Radio Frequency capability so they can communicate through walls and floors (if you use infrared remotes you'll need to install sensors remotely to send the signals back to your system's brain, which probably means more wires). A controller can also be as complicated as you want. Full home automation systems from companies such as Crestron can be programmed to not only let you control your media center from anywhere in the known universe, but can also integrate control of your home's HVAC, lighting, security system, etc. It's limited only by your imagination and the thickness of your wallet. It sounds complicated, but it doesn't have to be. With some planning and some hard-earned after-tax income, you can create a "digital nervous system" for your home that can enhance your lifestyle and maybe even increase your home's resale value. And let you groove to your favorite tunes and flicks from anywhere you want.